Play The Legend of Shangri-La Touch® for real! Get inspired and enlightened by NetEnt’s newest character Splionzo! In my opinion, a reincarnation of Gonzo and Master Splinter (as we all know him from the Teenage Mutant Ninja Turtles), although Gonzo is still pretty much alive on the reels in Gonzo’s Quest Touch®. I have to keep my imagination going and Splionzo was there to inspire me and I’m sure he will inspire millions all over the world. You can find your way to the wise monk via one of the many NetEnt Casinos available. Once you find him next to the reels in The Legend of Shangri-La: Cluster Pays Touch®, you’ll have to stay by his side as you might need him in the near feature. It’s not only Splionzo’s wisdom you’ll be fascinated with, also his walking stick will amaze you. Initially, you won’t see much magic in it, but be patient and you’ll magical things happening on the reels. Splionzo is of big importance for this mobile video slot that was launched by NetEnt in September 2017, but the game would have never been launched without a great design and gameplay. And there’s no need for me to say that a great design can be found in the game’s background, inspired by Shangri-La, and the many special effects. An earthly paradise has always been a recurring theme in tales and novels and humans will always long for such a paradise. That’s why many of us dream of blue sea with a white sanded beach where no one can be found except you. It’s you, the palm trees, maybe a small beach boat while a hermit crab finds a way into the sand. Another setting that’ll do as a peaceful utopia is Shangri-La which was described by the English novelist James Hilton in his 1933 novel Lost Horizon. It involves a harmonious Tibetan valley, a community in a monastery for Tibetan lamas. This heavenly place hides all the wisdom of the human race while all of its inhabitants live in peace and harmony. You now have a chance to experience Shangri-La in which you’ll be surrounded by a pink sea of Japanese Cherry Blossom while a rippling stream and soft falling waterfalls complete the picture. In the background the mountains rise high up in the sky, partly disappearing into the cloudy sky, adding to the mystery. Your experience is enriched with the tranquil sounds of harmony giving you the peace you might be looking for after a hard day of work. As part of the Cluster Pays™ slots series, the Cluster Pays™ mechanic is going to be responsible for most of the action on the reels. 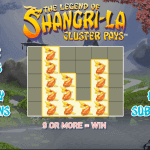 It forms the base of the gameplay in The Legend of Shangri-La: Cluster Pays Touch® in which clusters of symbols can be formed thanks to the video slot mechanic. 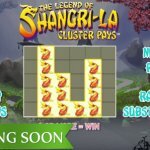 It is thanks to the Cluster Pays™ mechanic that no bet lines will be available in The Legend of Shangri-La: Cluster Pays Touch® while the standard 5×3 layout is replaced by a distinctive 5×6 layout. True NetEnt fans will immediately notice the similarities between The Legend of Shangri-La: Cluster Pays Touch® and Aloha! Cluster Pays Touch®, a Hawaiian-themed slot that was added to the Cluster Pays™ slots series first. The Cluster Pays™ mechanic forms a perfect base in The Legend of Shangri-La: Cluster Pays Touch®, but no real action without mobile slot features. 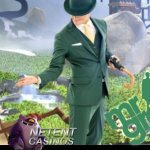 Luckily, NetEnt never disappoints when it comes to slot features adding Sticky Re-Spins, Random Substitutions, Nudge Reel, and Free Spins. Soon you’ll find out that you’ve been trapped in the illusion Shangri-La is a harmonious paradise, but excitement will be build up first by some standard slot features such as Stacked symbols and Wild symbols. Stacked Wilds appear on any reel and involves two symbols stuck together at least when it comes to the Guru symbols and Free Spins symbols as all other symbols and the Wild symbol can appear as a single symbol or in clusters of two or even more. Clusters of nine symbols award a win. Wild Symbols can appear anywhere but will only be useful when its able to transform into the adjacent symbol that creates the highest possible winning combination in a cluster. If no winning becomes possible with the help of the Wild symbol, the Wild stays Wild and the game continues. If two non-winning clusters can be found on the reels, a Sticky Re-spin might be activated. Featured symbols will stick to the reels while all other symbols spin again just until no new feature symbols can be added to the cluster. The excitement is growing and what is hiding in the mountains will soon be revealed. Three Free Spins symbols will help you to explore what is going on up there. These Stacked Free Spins symbol can appear half on the reels or complete. 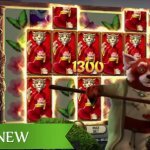 Three half Free Spins symbols will be enough to activate a minimum of 5 Free Spins. 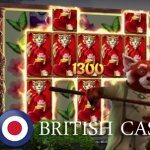 This number will climb up the more Free Spins appear in full with a maximum of 8 Free Spins being available. Splionzo might be showing one of his magic tricks here using his magic walking stick when a Nudge can save the Free Spins feature otherwise missed out on. Now I can advice to stay on Splionzo’s side as the peaceful life in Shangri-la will be roughly disturbed. Winter is coming! No worries as Splionzo will save the day, but be aware of the damages the ice dragon can cause high up there in the mountains.